I LOVE STORIES - AND I know that I create them by listening to my inner storehouse, choosing the script I want to see displayed on the stage of my day. I live in a wooden house - and in a from time to time windy area. And the song of the wind, or temperature changes, make the 30 year old walls sometimes crackle and quiver in its own unique melody. One day as the wind was whistling a strong tune, causing the branches of the trees to move energetically, I was sitting at the computer hearing a rustling noise from the south wall. I lifted up my head and concluded, Oh, must be a twig that tickles the siding of the outside wall - just let it be, I told myself. Periodically the gentle noise started again and with a sudden impulse, I decided to find out what was causing the sound. I walked around and stopped several times at the huge woodstove in the corner. It had not been used for months, so - surely the sound could not come from there. Yet, following another gentle impulse, I opened the heavy door of the stove and lo and behold - out flew a pretty red breasted bird. As it settled on the table, I put a light towel over it and carried it outside. Opening the towel, it peacefully flew to the big Live Oak tree over my house. It looked back at me and sang tweet, tweet, which sounded - and I know it was - Thank you! "THANK YOU" said my friend when she called a second time on Thursday. When she called earlier in the day, she mentioned her boyfriend Chris, who is going through an emotional and mental crisis, being spurred by the news about the lack of honesty and integrity in politicians worldwide. "He is so deeply concerned, it is affecting his mental equilibrium," my friend sighed. "He’s been discussing it with his minister and the minister’s empathy for his cause of concern made him feel better - but just for a short time! Then, in the middle of our conversation, my friend unexpectedly asks, "What shall I tell him so he can feel better?" I listened to myself for a moment and then quietly I said, to myself: Tell Chris, to throw off that emotional burden. It is none of his business what the world does. His only responsibility is his own life. If he wants to make a change, he needs to start with himself, by liking himself and by understanding what a great person he himself is - and then, as by magic, the world will become a different reflection, a reflection of the truth about himself. As my friend is familiar with Descartes’ saying Thoughts Are Things, we discussed energy - and that we are energy, and that all is energy, and - thought IS energy. We said good bye, both content, I because I had answered myself to my complete satisfaction and my friend because she got an answer that had meaning for her.When she called again in the evening, to say that "My talk with Chris worked, and he is relaxed and full of smiles again," She added, "Remember, Rosemary, the girl that went to nursing school with me and then went on to become a psychiatrist? Well, she is now in charge of a mental institution, but how come she never gives me such advice?" "Well, I said, I guess, it is because she has so many clinical explanations preplanned for any appearance - which makes it more difficult to listen within - and see beyond the illusion." HERE AT THE Absolute Monastery in Campo California, we were talking about having kittens since quite a while. One of the reasons being that we thought our dogs would adapt to a kitten easier than to an adult cat. But each time when we really started to actively look for them by asking people or looking at the local pin boards - we were always between seasons, smile! One day as I was paying for my purchase at the local hardware store, I noticed a little note that was partially sticking out from underneath a display box of batteries on sale. I saw the word "kitten" - and in a curious impulse I pulled it forward with my fingernail. 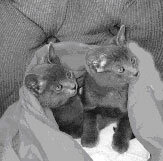 Kittens ready to give away in about six weeks, the note read. 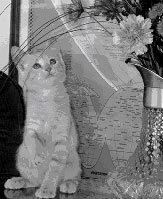 I wrote down the telephone number and - that is how the most beautiful, funfilled and lovable kittens came into our world - exactly at the right time and in divine order! My stories are my meditations come alive. My stories are my inner revelation of who I am displayed on the outer screen of life. My stories are created from the infinite storehouse of my inner allness! My stories are the DVD’s I choose to put into the DVD player of life - and I have chosen them from an unlimited source of possibilities. See Blondie, Ms Gray and Cara, our kittens. My choice. Such fun! Stories are all about listening!